« Day 574 OUT OF Beijing: San Francisco City Hall For The Holidays. Day 575 OUT OF Beijing: The Windy City. Jill, Dante and the fallen tree. All apologies to Chicago but San Francisco was doing its best to be the Windy City a few days ago. Jill and I took Dante, the dog we are sitting, for a walk and almost got blown away a few different times. Supposedly there were gusts above 60-70 mph at certain times. 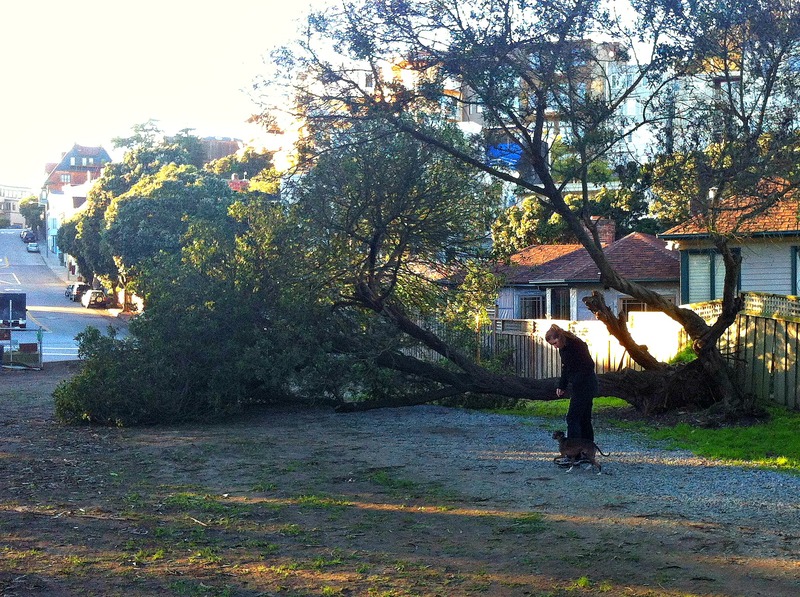 The winds knocked trees over all around San Francisco. Even Divisadero Street was shut down because of a huge tree that was blown over and blocked it completely from sidewalk to sidewalk. At Corona Heights Park, above where we are house sitting, a beautiful old tree was knocked over and it ruined the fence beside it. We did a short walk because Dante is so tiny we didn’t want him to get hurt. He seemed to actually enjoy the wind and was running around like mad. Maybe he was smelling all kinds of new scents and having fun with that. I’m just glad we got him home and safe and secure!